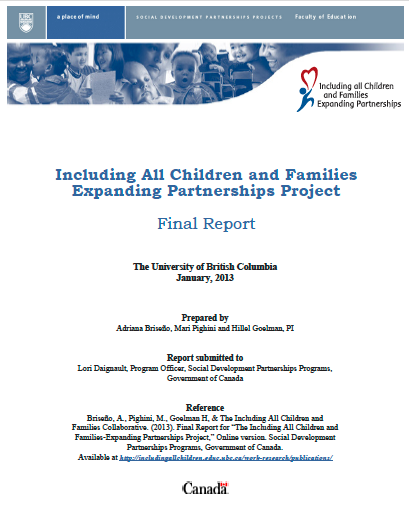 Our final online and interactive report describes the activities the Including All Children and Families-Expanding Partnerships Project (Social Development Partnerships Program, Government of Canada, 2009 – 2012) at the University of British Columbia. It includes a description of our research studies and summaries with preliminary findings, also outlining our next steps. The report also describes the resources and materials, including the online course and questionnaires for parents and professionals. We include links to audiovisual material that complements our report, for example, links to publications and online stories capturing different research and community-related aspects, a presentation on our trips to the North and Interior regions created by Maya Goldstein, MA, research assistant; and an interview with Dr. Dana Brynelsen, former Provincial Advisor with the Infant Development Program of British Columbia (IDP of BC) conducted by Adriana Briseno, Post Doctoral Fellow, UBC Faculty of Education. Pighini, M., Goelman , H.,Buchanan, M. Schonert-Reichl, K. and Brynelsen, D. (2012). Learning from Parents’ Stories about What Works in Early Intervention. Forthcoming-International Jounal of Psychology. Goelman , H., Ford, L., Pighini, M., Dahinten, S., Synnes, A., Tse, L., Ball, J. et al. (2011). What we learned about early identification and screening. In: H. Goelman, J. Pivik & M. Guhn (Eds.) New approaches to early child development. Rules, rituals and realities, pp. 95-116. New York: Palgrave. Guhn, M., Swart, S., Pighini, M. & Vilches, S. (2011). Graduate student experiences in the CHILD project: The invaluable contribution of interdisciplinary, collaborative research to young academics and professionals. In: H. Goelman, J. Pivik & M. Guhn (Eds.) New approaches to early child development. Rules, rituals and realities, pp. 179-200. New York: Palgrave. Pighini, MJ (2012). “From here to there I need a hand”: The experiences of parents of young children diagnosed with ASD. CIRCA Colloquium Series, Faculty of Education, The University of British Columbia (Pt Grey), March 6, 2012. Zdaniuk, B. & Pighini, M,J. (2012). Differences in Mental Health Service Utilization between NICU and Non-NICU Children Years 1 to 8. Poster presented at the 2012 Early Years Conference, February 3-4, Vancouver, BC, Canada. Goelman, H., Pighini, M., Synnes, A., Li, Z. & Lisonkova, S. (2010). Understanding the Health, Developmental and Educational Needs of At-Risk Children in BC. Paper presented at the 2010 Early Years Conference, February 5, Victoria, BC, Canada. Pighini, M.J., Goelman, H. & Brynelsen, D. (2009). Children and Families in an Infant Development Program: A Multiple Case Study. Poster presented at the 2009 DEC Conference, October 17, 2009, Albuquerque, New Mexico. Pighini, M.J., Goelman, H. & Brynelsen, D. (2009). 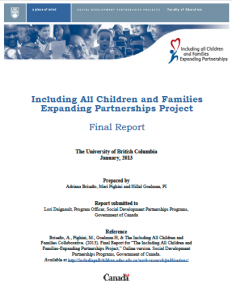 A multiple case study of children and families in the Infant Development Program of British Columbia. Poster presented at the 2009 Biennial Meeting, March 2009, Society for Research in Child Development, Denver (CO).